The Horror Section: It's A Jag! In celebration of Women in Horror Month, I picked out Gaylene Preston's 1984 Kiwi ghost tale Mr. Wrong aka Dark of the Night. 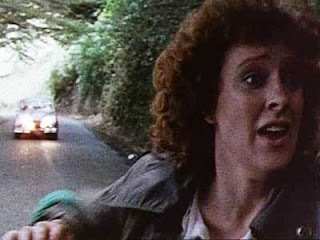 After a few unexplainable events involving her newly purchased Jaguar, Meg (Heather Bolton) starts to suspect it may be haunted. It would be easy to dismiss Mr. Wrong as a Christine rip-off, but it's really more of a mash-up of several classic urban legends. Adapted from a novel by Elizabeth Jane Howard, it very much had the ingredients of a campfire tale. Mr. Wrong was old school storytelling through and through with solid performances and steady direction. It has that naturalistic vibe that a lot of stuff from that corner of the world during that era. I especially appreciated that the moment something seemed off with the car, Meg was like, nope, and not only went about trying to sell it, but also immediately had the thing towed back to her place. I think that might be one of the smartest things I've seen a protagonist do in quite some time. My only real gripe is that the ending featured a pretty anti-climactic crash. I mean, do they not have cliffs in Wellington? Mr. Wrong was pretty tame by today's standards, but it's definitely the type of movie that I would remember fondly if I'd seen it in my childhood when I was ingesting stuff like Watcher in the Woods and Something Wicked This Way Comes.